Acetyl-D-Glucosamine is an amino monosaccharide. It is chemically related to glucosamine, chondroitin, and hyaluronic acid. These naturally occurring amino monosaccharides are found in cartilage and connective tissue. Glucosamine commonly is used to treat osteoarthritis in both humans and animals and there is an ever-increasing body of scientific evidence supporting its anti-inflammatory properties. Acetyl-D-Glucosamine has been studied in vitro to a lesser extent but it appears to have promise as a chondroprotective therapy. 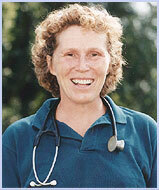 The treatment and prevention of osteoarthritis is an important clinical area in both human and equine sports medicine. There has been extensive research focusing on cartilage protection and the anti-inflammatory properties found in some of the naturally occurring components of cartilage. Hyaluronic acid and polysulfated gylcosaminoglycan (PSGAG) products have been approved for the equine market for many years. These products are thought to protect cartilage by inhibiting enzymes that break down cartilage, inhibiting prostaglandin, and decreasing inflammation. They also may stimulate the cells that rebuild cartilage and produce joint fluid. Only one study has been done comparing Acetyl-D-Glucosamine to the FDA-approved PSGAG product, Adequan®. This study was funded by Luitpold, the manufacturer of Adequan and presented at the American Association of Equine Practioners (AAEP) conference in 2004. In this study, Acetyl-D-Glucosamine was found not to be as effective as Adequan at the conventional dose and treatment interval. The author of the study said that while products such as Acetyl-D- Glucosamine are "likely" to have a "positive effect on injured or diseased equine joints," the work has not been done to determine an appropriate dose or treatment regime. Side effects from intramuscular injection are rare. The most-common side-effect is pain at the injection site. No side-effects or adverse reactions were seen in the 2004 study. No side-effects or adverse reactions were seen in the 2004 study. No published information regarding drug interactions has been found in the literature. No published information regarding overdose has been found in the literature.